Find a Discovery trip that explores Eastern Europe. There are 334 tours to choose from, that range in length from 3 days up to 38 days. The most popular month for these tours is September, which has the most tour departures. "I thoroughly enjoyed the Costsaver Highlights of Bohemia tour. Amy, our Tour Director,..."
"Legend/10. Fun, knowledgeable and organised. 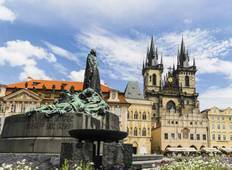 Jemma made our Eastern European trip..."
"In my opinion, this tour is on the pricey end. It is not much of a tour, I will say..."
"Such an amazing trip with an incredible guide!! His dedication and the knowledge..."
"Our tour director was Brian Ridley-He was amazing-such a wealth of knowledge,very..."
"I have traveled on many guided vacations and this was one of the best. My Travel..."
"Will was an amazing guide and and all round top bloke. So easy to get along with..."
"The trip was FUNtastic, the food, the guide, the group, the places we visited, everything..."
"Had the best trip with Kaz and our driver Nadine!! Wonderful tour full of wonderful..."
"Our trip was a family trip of 17 adults , and Greg did a great job at looking after..."
"Lucy was absolutely amazing best tour guide I have ever had! So fun and on to it..."